On NBA TV's "Open Court" show, Steve Kerr tells a story about Toni Kukoc's pregame ritual that is a little different from what we're probably expecting. In terms of epic Toni Kukoc stories, this one told by former teammate Steve Kerr on the NBA TV show “Open Court” has to rank among the very best. Steve Kerr's First Interaction with Michael Jordan. Steve Kerr tells a classic story of his first impression of Michael Jordan during his rookie year with the Suns. 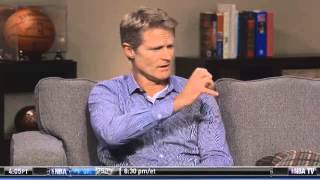 Nov 23, 2011 · Steve Kerr tells a classic story of his first impression of Michael Jordan during his rookie year with the Suns. Oct 23, 2013 · ... former Bulls forward Toni Kukoc had his own ... His teammate Steve Kerr was recently on NBA Open Court and shared a little ... Hottest Sports Stories.